Great care needs to be taken when choosing bathroom lighting as the regulations are very strict concerning the type of light you can use in certain locations. The following information is a guide to help you understand which fittings can be installed in which location. This is not an installation guide and reference should be made to the IEE wiring regulations or a qualified electrician. Firstly it is important to understand the rating by which bathroom and some outdoor lights are classified. IP rating stands for ‘Ingress Protection’ and is always followed by two characters. These numbers refer to the level of protection from solid objects and liquids. 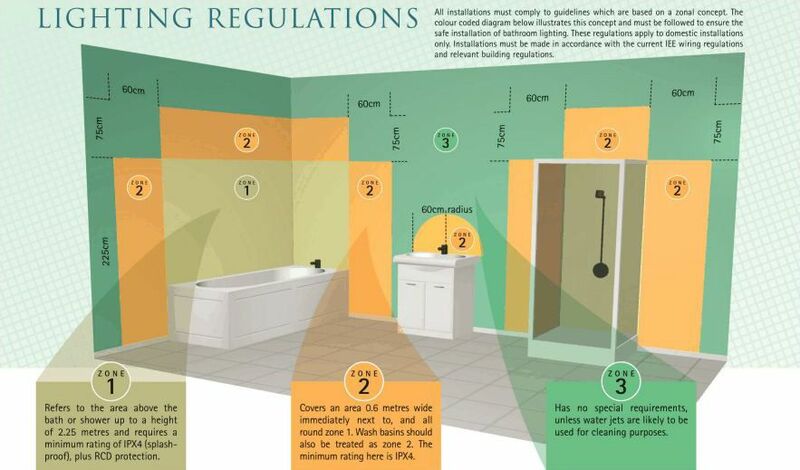 It is important that you choose fittings with the correct rating according to where they are to be sited in the bathroom. Zone 0 is inside the bath or shower itself. Any fitting used in this zone must be low voltage (max 12v) and be rated at least IP67 which is total immersion proof. Zone 1 is the area above the bath to a height of 2.25 metres from the floor. In this zone a minimum rating of IP44 (splashproof) is required. If the fitting is mains voltage ie 240v then an RCD (residual current device) must also be used to protect the circuit in this zone. Zone 2 is an area stretching 0.6 metres outside the perimeter of the bath or shower cubicle and to a height of 2.25 metres from the floor. In this zone a rating of at least IP44 is required. In addition it is good practice to consider the area around a wash basin, within a 60cm radius of the taps to be classed as zone 2. Zone 3 is anywhere outside zones 0, 1 and 2 (subject to specific limits) and where no water jets are likely to be used. No IP rating is required. In addition to the above if there is a likelihood of water jets being used for cleaning purposes in zones 1, 2 and 3 then a fitting rated minimum IP65 must be used.